It sounds like an amazing deal — endless-rotary and (even more incredibly), moving-fader controllers for well under £200 each. But have Behringer gone a price-cut too far this time? The past few years have seen an explosion in the number of affordable MIDI controller boxes available on the market, at prices that would have been unthinkable a few years ago. Inevitably, there is now a range of products at a variety of prices, from handy little boxes that feature just a few knobs or small faders in compact packages for the same price as a budget soundcard, right up to moving-fader assignable control surfaces that cost more than a computer. And as in any competitive market, manufacturers keep bringing out new controllers that offer more functions and features at prices that seem astonishingly low — until the next price-lowering development. Behringer are the latest company to throw established controller price conventions on their head. Their first steps into products specifically aimed at computer users are two cross-platform USB-equipped MIDI controllers — a logical move. The BCR2000 features no less than 32 rotary encoders, plus a host of assignable switches, and retails for just £140. The second unit, the BCF2000, offers eight faders, plus eight rotary encoders and loads of switches, for just £180. That's still good value, but you might be curious about a price difference that buys fewer simultaneously useable controllers. Well, that extra 40 quid buys you eight 100mm motorised faders, which I think is unheard of in this price range. Both the BCR and BCF have identical dimensions and overall shape. They even share a raised row of rotary encoders and switches across the top, a four-digit LED display and a strip of edit and assignable switches down the right. Operation is so similar for both units that Behringer have produced just one slim manual for both units (as usual with Behringer, other European languages are supported with multiple translations). A glossy four-page 'preset' leaflet is the only documentation specific to either controller box. There is more documentation available from Behringer's web site as PDF files, and some of it is rather useful. It would be nice if this material — plus drivers and some further extras — were packaged with the controllers in future on CD. Though both devices will work with Mac OS X and Windows XP straight out of the box, Behringer recommend their dedicated drivers for Windows users. Once again, these are only available on line. A mains lead and USB cable are included in the box, which is very thoughtful. The knobs that populate the raised front-panel section of both controllers (and the whole front panel of the BCR) are in fact endless rotary encoders: they have no end stops, and their current position is indicated by a ring of LEDs that surround the encoders. The LEDs not only let you know where you've moved a given parameter to, but also change to reflect a parameter's position when you switch between presets or banks of controls in your host software. In addition, each of the eight encoders on the upper raised section is actually a push encoder: they can have a MIDI parameter assigned to their left/right movement and also to their push state. Two rows of assignable buttons, each with its own integral LED, finish this section of the front panel. In most standard mixer controller configurations, you can expect these controls to function as pan pots, and Mute and Solo switches. To this end, it might have been nice if the two rows of buttons had different colour LEDs; the integral LEDs in both rows are red. The four-digit display indicates the currently selected controller assignment preset — there are 32 on both B-Controls — or edit parameter/parameter value, depending on what you're up to. The display reflects as best it can with four digits on-screen changes in host software, too. Below the display, four buttons labelled 'Encoder Groups' switch the top row of encoders, so that per preset there are actually 32 push encoder assignments, in four banks. I also expected the two rows of buttons to be grouped, but they aren't: there are just the two rows of eight for each preset. Moving downwards, we encounter activity LEDs: each of the rear-mounted MIDI sockets can be monitored in this way (there's an In, an Out and an Out/Thru), as can each of the rear-panel sockets where foot controllers can be attached. On the BCR, these are configured for two footswitches, while on the BCF, they're configured as a switch and a continuous controller jack (for a volume pedal, say). Returning to the front panel, the System buttons are next, below the Activity LEDs, and they are not assignable. You press Store to save an edited preset, hit Edit to go into Edit mode, and Exit gets you out of Edit or Global mode (accessed by pressing Edit and Store together). The Learn button makes light work of controller assignments by letting you simply move the on-screen control you want to assign. Below these are the up/down preset selection buttons, and last of all are four further buttons that are fully assignable: they tend to be set to control sequencer transport functions in factory presets. So much for the similarities between the BCF and BCR — what about the differences? Well, as is pretty obvious, the BCF2000 offers those eight motorised faders, and the BCR2000 is equipped with three rows of eight rotary encoders, again with position indicated by a ring of LEDs. A word about these 24 encoders: unlike the ones along the raised top section, they are not push encoders, and the build quality of the B-Controls doesn't feel up to heavy testing of this point! If you press too hard on an encoder, it may well break. Operationally, the two units are obviously similar — as the identical manuals suggest — and which one you choose depends on how you like to work. If you absolutely prefer faders, then the BCF will be the one. But if you're not bothered, or find that knobs suit your approach to on-screen control, then having 32 controllers in front of you without any kind of bank switching will be attractive. The MIDI connections are rather more flexible than you might at first think. When a B-Control (either one) is connected via USB to a computer, these connections can function as a basic MIDI interface, either one-in/one-out or one-in/two-out, depending on which operating mode you're in. In addition, it's not even necessary to connect the controllers to a computer: if you want hardware control over a workstation synth or sampler or some sort of MIDI-equipped rack gear, then the Behringers will happily work via MIDI only. The same goes if your computer lacks USB, or free USB connectors — provided you have the spare MIDI I/O on your main interface, you'll still be able to hook up the controllers and use them fully. Practically all features available to the B-Controls when interfaced to a computer are available in stand-alone mode. You'll have to create most of your profiles from scratch, though, or at least until the B-Control community grows enough for users to start sharing their work. But perhaps you could be in the vanguard of that community! Rather neatly, two B-Controls can be linked together via the MIDI sockets, set to a specific operating mode and then connected to your computer via a single USB cable. Two units are recognised, and there's even a MIDI Out free for your host software to access — a pretty efficient way of cabling. In general, both B-Controls have one small problem, and that's in the area of labelling. Even though 32 presets isn't a large complement, it still represents a huge number of assignments. A single BCR2000 preset, for example, has a potential 110 individual assignments. This leaves us with trying to keep track of what knobs or faders are doing what in which preset. Behringer help a little, with slim scribble strips running across various bits of the front panel, but these are only good for one set of assignments. The alternative is to photocopy the supplied preset sheets (or print out the PDF equivalents) and write assignments out by hand. If you're thinking, like me, that the logical step beyond these two USB-equipped MIDI controllers is to add audio interfacing to create a composite front-end system for a music computer offering audio I/O and extensive MIDI-control facilities, then we're thinking right on Behringer's wavelength. The B-Control Audio BCA2000 wasn't yet available as I concluded this review [it turned up at SOS just as we were going to press — Ed], but will be one of the few USB 2.0-equipped multi-channel audio interfaces on the market, and also offers basic one-in, two-out MIDI interfacing. The audio side is quite well thought-out, with a choice of analogue sources: one high-impedance guitar input is joined by a pair of phantom-powered mic inputs and a stereo line input pair. Only three analogue inputs can be used at any one time, but they can be treated to simple dynamics processing, in the shape of a noise gate and limiter. Digitally, the interface is equipped with optical and co-axial connectors, but is compatible with ADAT, S/PDIF and AES-EBU formats. There are apparently surround monitoring options, too. In total, the interface can handle eight input and eight output audio channels simultaneously. Metering is well-thought out, as are the monitoring options. Behringer promise low-latency ASIO 2 and WDM audio drivers. Fidelity fans will welcome the 96kHz 24-bit convertors, and wallet-watchers will breath a sigh of relief at the proposed retail price: £180. Watch out for a review in SOS soon! Out of the box, the B-Controls are loaded with a few handy ready-made presets, and there are plenty more available for download at Behringer's web site. For example, one preset lays out all continuous controller numbers from 1 to 94 (on the BCF) and 1 to 110 (on the BCR) on MIDI channel 1. Another functions as a simple mixer. The Banks for the eight raised push encoders allows them to function as controls for Pan, Balance (for stereo channels), Effects send 1 or Effects send 2. The BCF then has eight level fades, obviously, but the BCR in this preset adds control over two-band EQ, since it has two extra rows of controllers per preset. As expected, there is even a General MIDI/GS/XG control preset, but the most interesting profiles are to be had from the company's web site. This should be your first stop before trying to create your own presets. Nearly every device within Reason has a profile, as do most Native Instruments products. Cubase SX is covered, as is Apple's Logic and Cakewalk's Sonar. All you need is some sort of SysEx utility with which to send the data to the controllers (the same goes for B-Control firmware updates; they're SysEx dumps, though PC users can use a handy custom Behringer update utility). But eventually there will come a time when you want to create presets from scratch. It isn't that hard; the job can feel a little cramped, due to the small display, but when editing, the push encoders double up for choosing data types and values, MIDI channels and so on. Even so, the easy option for most assignment tasks remains the 'Learn' mode: just tweaking a parameter on your target MIDI application sends the necessary information at the B-Control, ready for capture and assigning to the fader, encoder or button of your choice. Of course, there's some software that lacks MIDI Out, in which case you'll have no choice but to go about the process manually. Propellerhead Reason falls into this category, but it's very well supported on Behringer's web site. Nearly any MIDI data can be be learned or manually input and assigned to any control: program changes, control changes, MIDI notes, pitch bend, MIDI Machine Control, NRPNs, SysEx strings and so on. And if you think creatively, you should be able to assimilate the control concept both in the studio and when playing live. For example, you could trigger samples or loops, control hardware sequencers, use the faders on the BCF as drawbars for software or hardware organs, play MIDI-equipped lighting rigs, and so on. B-Control parameters can be customised as to how they respond, too. For example, when assigning an encoder to a parameter such as pan, the LED ring lights solidly as you move the encoder right or left. You could also simply choose to have one LED light at a time as a parameter is moved. Just remember to store your work once you've finished editing! If you check out the box on the final page of this review, you'll find another alternative in the shape of the recently released (and free!) BC Edit application. With this on your computer, there's no need to edit the B-Controls in any other way. Recent updates to the B-Control firmware (from v1.06 upwards) have introduced a handful of rather interesting control options — though at the moment, this applies to the BCF2000 only. 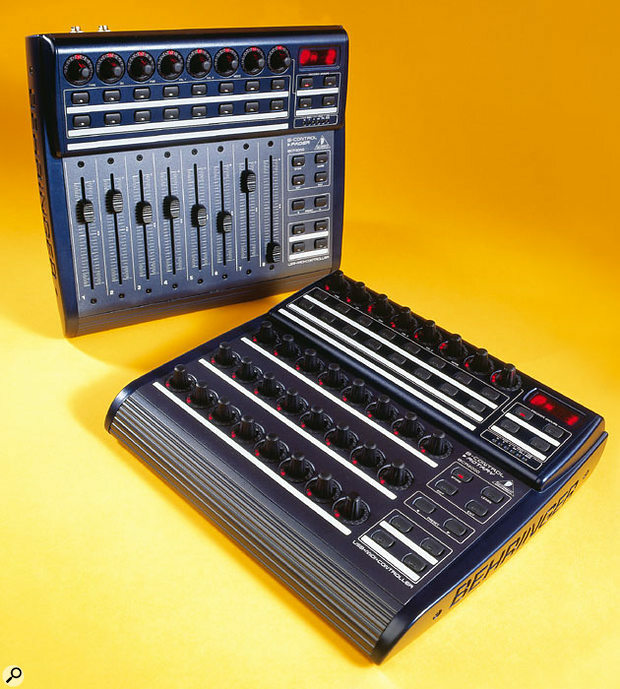 By pressing the correct buttons during power-up, its possible to convince the BCF that it's a Mackie Control for Steinberg Cubase SX and Nuendo or Cakewalk Sonar, a Logic Control for Apple Logic, or a Mackie Baby HUI for various applications, including Pro Tools and Cubase SX or Nuendo. When emulating these other controllers, the BCF has very similar functionality, with banks of eight mix control channels changed by the preset up and down buttons. In Pro Tools LE, for example, level-riding, pan, solo, mute and track-arm functions are supported, along with basic transport operations. Editing the B-Controls from their front panel is no great hardship — the 'learn' option makes the process fairly painless. The display is small, though, and keeping track of controllers with no way to physically label them can be tricky. This sort of thing is always easier with a software editor, and Behringer apparently planned such a thing from the start. 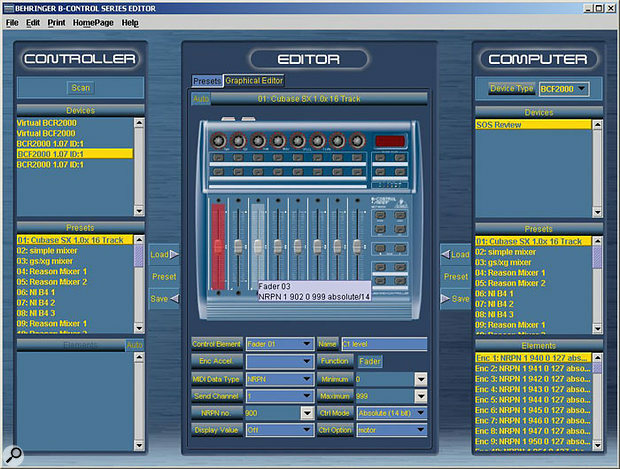 Behringer's free BC Edit software is a Java applet that'll run on any Java-equipped computer. Though currently a beta release, it offers great functionality and seems stable. While I was finishing this review, BC Edit v0.2 beta 3 was released. The most surprising thing about this free editor is that it's a Java applet, and will thus run on any platform with a compatible Java environment. It doesn't matter whether you're a Mac OS, Windows or Linux devotee, the editor will work. The early version I used was functional, if a little bit clunky, though that is probably down to Java more than the Applet itself. All encoder, button and fader assignments can be customised with a basic but clear graphic display (and that includes managing the four possible banks of controllers). Sets of presets can be saved to your hard drive, and moved to and from any attached B-Controls. There's even a hint in the user guide that the software may become compatible with 'future MIDI controller products'. We await Behringer's forthcoming news with interest! First impressions of the B-Controls are good: they're a nice chunky size without being too big, there's loads of rooms for fingers between knobs and faders, and delays between control moves and on-screen action were undetectable in my tests. The faders feel good if a little flimsy, and the encoders move well, with great visual feedback from the LED rings. Closer examination leads one to the conclusion that the packaging is a little plasticky, but bearing this in mind should lead to a long and happy working life. I mean, I can be impressed by build quality as much as the next guy — for example, CM Labs' Motormix is a wonderful piece of hardware, as well as offering an amazing feature set. But I remain drawn to any piece of equipment that does the job of something listing at £600 for well under £200. The nearest competition, for the BCR at least, may well be Doepfer's Drehbank, with 64 knobs on board (and 128 controllers available via banks) at a price of around £275. It's very hard not to like the B-Controls, and though price alone will ensure them a big slice of the MIDI controller market, their functionality is such that even demanding users won't be disappointed. The integration with software is exactly what most of us need, both in terms of simple control and editing and for recording complex mixes or parameter changes into a sequence. Although it can take a while to get used to which controls govern which on-screen elements in certain applications — Reason 's Subtractor synth, for example — being able to access all those parameters at once is highly welcome. Editing the BCR and BCF from their front panels is reasonably acceptable, though the 'learn' function and free editing software mean that most of us won't have to in most situations. It remains reassuring to know that the process is as straightforward as dealing with MIDI bits and bytes can be, though. Behringer seem committed to supporting these devices, with all those on-line documents for free download. Still, it would be nice to see some of this material collated onto a CD supplied with the controllers themselves. My wish list isn't that long: offering a few USB outputs might have been a nice gesture, adding hub functionality to what is already a great package. A Snapshot mode would have been good, too, especially when using the B-Controls in stand-alone mode with hardware instruments, or when working live (that said, something like this option can be achieved when switching presets). I do wish that all controls could be switched to four banks worth of assignments, not just the top eight push encoders. And perhaps 32 memories won't be enough for some users. The non-computer using community — it does exist! — will have to find other solutions if they need more presets than the onboard memory will supply. My concerns regarding the wider potential of the B-Controls were addressed by the firmware updates that appeared during the review. It's great that dedicated presets are available for popular sequencers and software synths, but anyone with experience of the more upmarket hardware controllers and the way they integrate with software might have felt that they were missing something. The new emulation modes deal with most of these issues, allowing the BCF, at least, to control sessions of any size in the major sequencers. As a person with an increasingly virtual musical life, I find versatile hardware controllers such as these increasingly attractive. I may enjoy my streamlined computer-based studio, but I often miss the hands-on control offered by real synths and real mixers. Neither of Behringer's new controllers takes up much desk space, and at these prices, they are pretty unmissable. If you're canvassing the market, as I am, then our choice has just become a lot easier. Loads of knobs (on BCR). Good profile support from Behringer via their web site. Somewhat insubstantially built, although this isn't surprising at this price. Some useful documents and drivers are only available on-line. Any niggles about build quality aside, these boxes work well, and are great value, the BCR especially: it's the cheapest, and offers such an impressive number of encoders! BCF2000, £180; BCR2000, £140. Prices include VAT. Behringer +49 2154 9206 6441.